An extraordinarily bright isolated star has been found in a nearby galaxy — the star is three million times brighter than the Sun. All previous similar “superstars” were found in star clusters, but this brilliant beacon shines in solitary splendour. The origin of this star is mysterious: did it form in isolation or was it ejected from a cluster? Either option challenges astronomers’ understanding of star formation. An international team of astronomers  has used ESO’s Very Large Telescope to carefully study the star VFTS 682  in the Large Magellanic Cloud, a small neighbouring galaxy to the Milky Way. By analysing the star’s light, using the FLAMES instrument on the VLT, they have found that it is about 150 times the mass of the Sun. Stars like these have so far only been found in the crowded centres of star clusters, but VFTS 682 lies on its own. 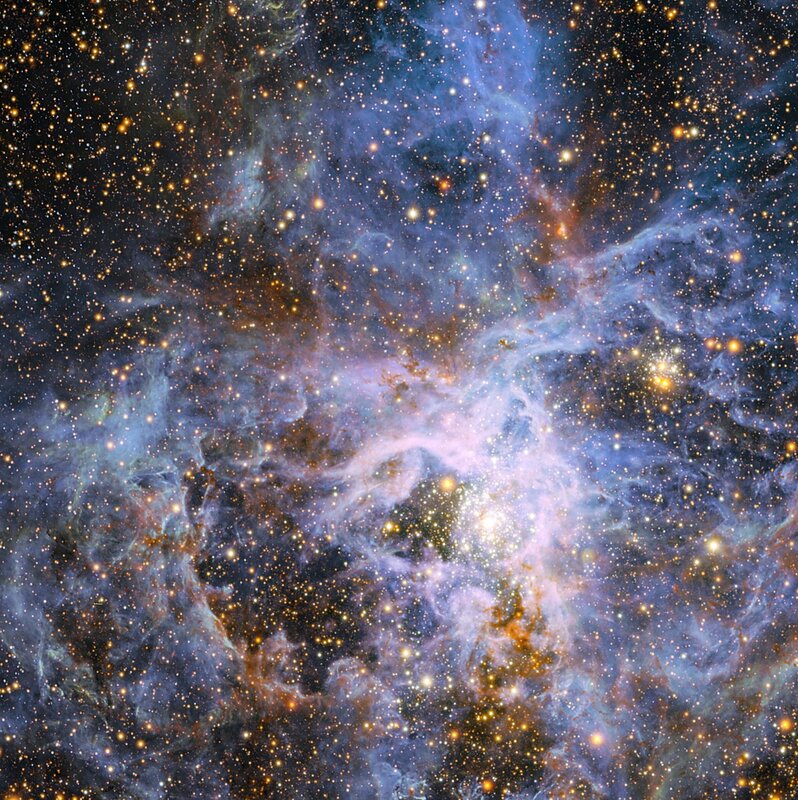 This star was spotted earlier in a survey of the most brilliant stars in and around the Tarantula Nebula in the Large Magellanic Cloud. It lies in a stellar nursery: a huge region of gas, dust and young stars that is the most active star-forming region in the Local Group of galaxies . At first glance VFTS 682 was thought to be hot, young and bright, but unremarkable. But the new study using the VLT has found that much of the star’s energy is being absorbed and scattered by dust clouds before it gets to Earth — it is actually more luminous than previously thought and among the brightest stars known. Red and infrared light emitted by the star can get through the dust, but the shorter-wavelength blue and green light is scattered more and lost. As a result the star appears reddish, although if the view were unobstructed it would shine a brilliant blue-white. As well as being very bright, VFTS 682 is also very hot, with a surface temperature of about 50 000 degrees Celsius . Stars with these unusual properties may end their short lives not just as a supernova, as is normal for high-mass stars, but just possibly as an even more dramatic long-duration gamma-ray burst , the brightest explosions in the Universe. Although VFTS 682 seems to now be alone it is not very far away from the very rich star cluster RMC 136 (often called just R 136), which contains several similar “superstars” (eso1030) . “The new results show that VFTS 682 is a near identical twin of one of the brightest superstars at the heart of the R 136 star cluster,” adds Paco Najarro, another member of the team from CAB (INTA-CSIC, Spain). Is it possible that VFTS 682 formed there and was ejected? Such “runaway stars” are known, but all are much smaller than VFTS 682 and it would be interesting to see how such a heavy star could be thrown from the cluster by gravitational interactions. The name VFTS is short for VLT-FLAMES Tarantula Survey, an ESO Large Programme led by Christopher Evans of the UK Astronomy Technology Centre, Edinburgh, UK. The Local Group is a small group of galaxies that includes the Milky Way and Andromeda galaxies, as well as the Magellanic Clouds and many smaller galaxies. For comparison the surface temperature of the Sun is about 5500 degrees Celsius. Gamma-ray bursts are among the most energetic events in the Universe and the high energy radiation that they produce can be detected by orbiting space craft. Gamma-ray bursts lasting longer than two seconds are referred to as long bursts and those with a shorter duration are known as short bursts. Long bursts are associated with the supernova explosions of massive young stars in star-forming galaxies. Short bursts are not well understood, but are thought to originate from the merger of two compact objects such as neutron stars. If VFTS 682 is at the same distance from the Earth as R 136 then it lies about 90 light-years from the centre of the cluster. If the distances are significantly different then the separation could be much greater. 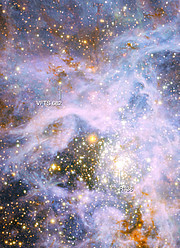 This research was presented in a paper, “The VLT-FLAMES Tarantula Survey III: A very massive star in apparent isolation from the massive cluster R136”, to appear in Astronomy & Astrophysics. The team is composed of Joachim M. Bestenlehner (Armagh Observatory, UK), Jorick S.Vink (Armagh), G. Gräfener (Armagh), F. Najarro (Centre of Astrobiology, Madrid, Spain), C. J. Evans (UK Astronomy Technology Centre, Edinburgh, UK), N. Bastian (Excellence Cluster Universe, Garching, Germany; University of Exeter, UK), A. Z. Bonanos (National Observatory of Athens, Greece), E. Bressert (Exeter; ESO; Harvard Smithsonian Center for Astrophysics, Cambridge, USA), P. A. Crowther (University of Sheffield, UK), E. Doran (Sheffield), K. Friedrich (Argelander Institute, University of Bonn, Germany), V.Hénault-Brunet (University of Edinburgh, UK), A. Herrero (University of La Laguna, Tenerife, Spain; ESO), A. de Koter (University of Amsterdam; Utrecht University, Netherlands), N. Langer (Argelander Institute), D. J. Lennon (ESA; Space Telescope Science Institute, Baltimore, USA), J. Maíz Apellániz (Institute of Astrophysics of Andalucia, Granada, Spain), H. Sana (University of Amsterdam), I. Soszynski (Warsaw University, Poland), and W. D. Taylor (University of Edinburgh).